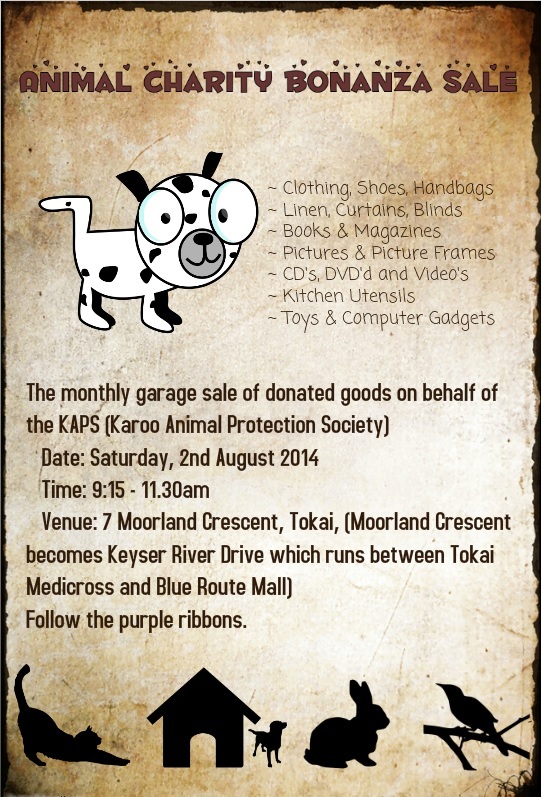 The monthly garage sale of donated goods on behalf of the KAPS (Karoo Animal Protection Society) will be held on Saturday, 2nd August 2014, 9:15 – 11.30am at 7 Moorland Crescent, Tokai, (Moorland Crescent becomes Keyser River Drive which runs between Tokai Medicross and Blue Route Mall). Follow the purple ribbons. Items for sale include secondhand clothing, shoes, handbags, jewellery, linen, curtains, blinds, ornaments, collectables, glassware, books, magazines, pictures, picture frames, CD’s, DVD’s, LP’s, videos, kitchen utensils, suitcases, toys and gadgets for computers/gardens/electrics, etc. Contact Annalien. KAPS is the only organisation providing a mobile welfare service for animals in the deprived areas of the Little Karoo in rural South Africa.